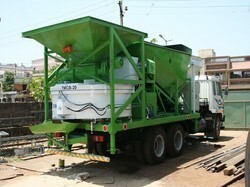 We are engaged in offering a wide range of Concrete Batching Plant, also known as truck mounted. 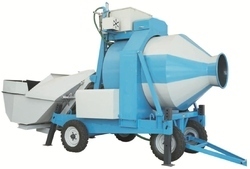 We offer technological advanced and precision engineered Concrete Batching & Mixing Plant. Fabricated using fine raw material these are widely appreciated across the construction industry for durability, accurate dimension, and sturdy construction. Our complete range of concrete batching mixing plants is widely preferred by our clients across the globe as it delivers precise mixture results. These are extensively used in construction. This plant is acknowledged for its outstanding features like greater functional reliability and perfect mixing of construction material. We offer this compact yet highly effective equipment at market leading prices. Capacity15,20,125 m3 / hModel/TypeMCB - 20Number Of Bins4Overall Weight (kg)10 TonPortableYesTotal Length10.7 Mtr.Total Width2.14 Mtr.Total Height2.75 Mtr. 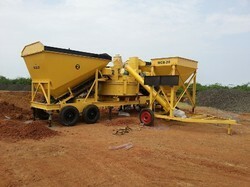 We are leading supplier of Mobile Concrete Batching Plants. Chassis: Heavy Duty & Robust & Balanced Chassis. & Reverse Rotation Discharge of Concrete. Water Tank with Overflow Arrange. Loading Hopper: Hydraulic Operated with Heavy Duty Power Pack. Centralized Lubrication System: Facilitates Lubrication of Bearing of The Transmission System. Digital Type Weighing System: Based on Load Cell Principal Three Compartments (03 Bin) Three Bin System with Three Digital Indicator Display. With Inbuilt Auto Water Dozing System: Automatic Water Control System. 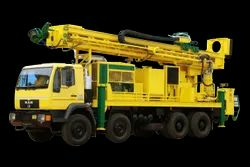 We are among the reputed organizations, deeply engaged in offering an optimum quality range of 10 Inch Water Well Drilling Rigs. 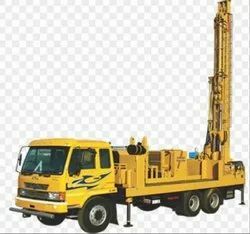 With sincerity and hard work of our professionals, we have carved a niche for ourselves in this domain by providing a premium quality gamut of 8 Inch Bore Well Drilling Machine. Looking for Construction & Heavy Machineries ?